> There is no twee April Fool prank. When I was younger, I’d flip the site backward on April Fool’s, but this year I basically forgot what day it was. > This is a about a trip I took, but I have no great photos. This is because Spring Business Trip 2015 was actually TNP’s very own Annual Meeting for our members. 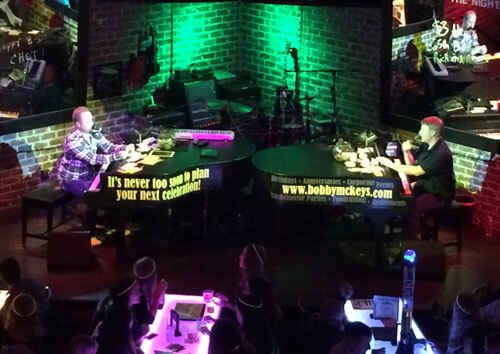 On the first night we had our staff party at the dueling piano bar. Drinks were free. My judgment was poor. See, there’s a huuuuge difference between merely exhibiting at someone else’s meeting, and working at your own. Namely, hours. I was up at 4:30 every day, was in the staff room for breakfast at 5:30 and my shift wasn’t done until a little after 7.Then, we rustled up dinner and collapsed into bed to start the next day. I visited zero shops, and didn’t even ride the gigantic Ferris wheel. But that’s okay. I was tired and knew I’d pay the price if I pushed myself. Most of the days were spent standing, and I have not spent that long standing since my days at The Disney Store. The meeting was at the Gaylord National hotel, a skosh outside of Washington DC. The hotel was gorgeous. The food was fabulous and the bed was just the cushiest softest thing ever. Screaming muscles aside, I had a fantastic time and am glad I went. It was nice to see something that has been planned for years come to fruition. It was also nice to see the faces of our members. Usually (for me, anyway) they are merely names and numbers in a database. Now I have thousands of faces to go with the names. I may even remember a few! When I left the Gaylord yesterday morning, I was filled with warm fuzzies. And wracking pain. And then I lost my wallet at Union Station on the way home. I’m guessing I dropped it around Au Bon Pain after buying some snacks for the train ride. I was without it for about 45 minutes when I realized it was gone. Lost: cute Kate Spade wristlet, containing: driver’s license, debit card, credit card, insurance card, AAA card, some business cards and about $15 in cash. My sad wallet setup. 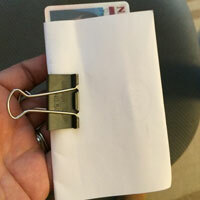 Paper and a binder clip. In the 90 minutes between losing the wallet and stopping the cards, someone took my credit card and hit Best Buy and a liquor store. Oh hooray. ANYWAY I spent from 8-9am at the DMV getting a replacement license. I filed a police report (online!) with the Washington DC police. I bought a cheapy wallet at Target. And now I get on with my life. 1. I will add on some days at the end of the trip to relax at the hotel. 2. I will be 30 pounds lighter, so standing won’t murder me.